Firstly, you will not be surprised to learn that over recent months, the queen of the TV backlog has had many, many more series to add to the TV backlog mountain, or should that now be a mountain range?? With this in mind I'm changing the focus of my TV reviews from what was on telly in a particular month, to what I watched that month. I always chuckle to myself when everyone talks about catch-up and on-demand TV, or recording things to watch later. I have been doing that for years! The first three months of 2016 have been a combination of home improvement, exhaustion and Eurovision national finals - what a combination eh! - so I haven't had time to post my monthly TV reviews so I'm wrapping up Q1 into a bumper review here. It would appear that the foreign telly love-in which began with "The Killing" and "Borgen" and went on to give us numerous other cracking subtitled programmes from the continent shows no sign of slowing down. 2016 has brought us a deluge of European subtitled drama: Channel 4 launched its online "Walter Presents" strand showcasing lots of different international drama. 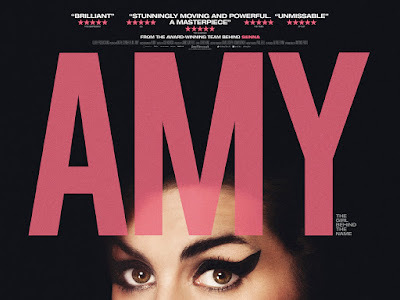 Sadly, many people are still sceptical of watching anything with subtitles, which probably explains why these shows are often tucked away on BBC4 or More 4 or Sky Arts. So what happens when you take the risk of putting a German import in a prime-time TV slot? Well, you only end up with the highest-rating foreign-language TV show in UK TV history. 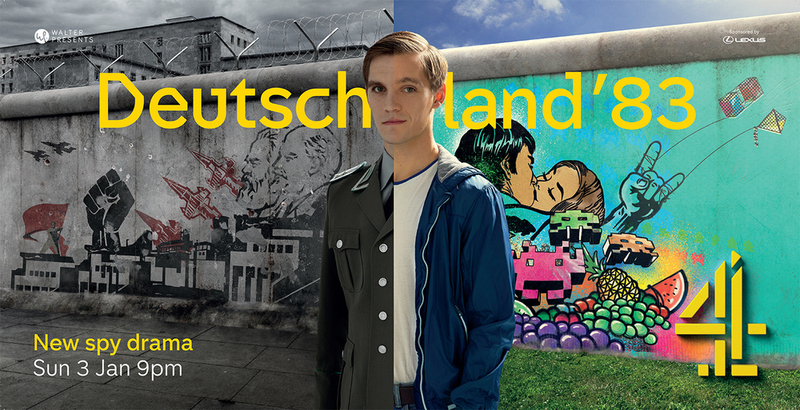 Yes, that's right...that honour goes to my favourite programme of 2016 so far, "DEUTSCHLAND 83" (Channel 4), a fast-moving and consistently watchable weekly drama which was a rarity these days....it was genuinely 'appointment to view' TV and I counted the days until the next episode. But it's now over and there's a great big Martin/Moritz-sized void in our viewing schedule. I think the reason it did so well is that it worked on many different levels - whether you had an interest in the history and politics of that period (my reason for watching), or if you liked pacy spy thrillers, or if you were just fangirling/fanboying over leading man Jonas Nay - it had something for everyone. Good characters, good acting, edge-of-seat cliffhangers and areat soundtrack too, and I forgot just how much I liked its theme song, "Major Tom" by Peter Schilling. I remember when the song was out in the 80s but never fully appreciated it until it turned up as the theme song (although strangely enough, it was actually New Order's "Blue Monday" which was the theme to the show when it aired on German TV). Go check "Major Tom" out on YouTube. https://www.youtube.com/watch?v=Jt-R5hj_lWM All together...."4, 3, 2, 1, earth below us.....". It looks as if there will be a follow-up series - I'd particularly love a "Deutschland 89" with the events leading up to the fall of the Berlin Wall. So we've had two series so far: the first one focused on the battle for the French presidency and the rival spin doctors Simon Kapita (Bruno Wolkowitch) and Ludovic Desmeuze (Gregory Fitoussi, pictured above) manipulating everything behind the scenes, with some other storylines on the side. Series 2 focused on a new president and his wife, secrets, lies and a hostage drama. Unfortunately it falls short of the greatness of Borgen, and the writers could have created stronger female characters. Despite actresses with such presence as Nathalie Baye and Carole Bouquet, the women have been very much the secondary characters here, with les hommes ("Les Hommes de L'Ombre" is the original title of the show) having the bulk of the action. Series 2 has just ended (I still have the final episode to watch) but I believe that there will be a third series so it's not all over yet. After bringing us a few series of "Dag", Sky Arts has gone back to Norway with "OCCUPIED", a big-budget drama from an idea by top thriller writer Jo Nesbo. 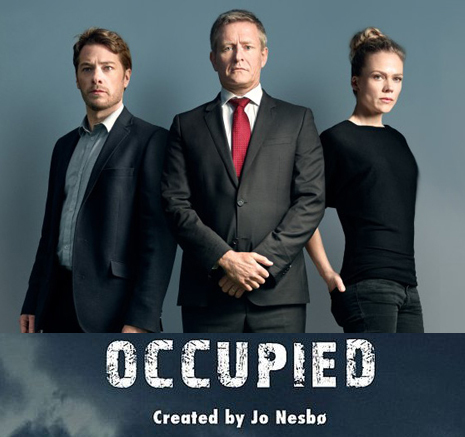 This series has been must-see viewing for me over recent weeks, although I initially didn't think I'd keep watching beyond the first episode, and also because I found Jesper Berg (prime minister) such an irritating character. The series is set in a climate-change future where the Green Party is in power and cuts off fuel production in favour of alternative energies, leading to a major energy crisis and an "intervention" by Russia, at the EU's request. Eventually everyone has to decide which side they're on, and it's this moral question which, I think, elevates this drama and keeps it interesting and exciting. Series 1 has just ended here, I still have two episodes to watch. Let's go back in time now. Back in the 'old days' January would mean the arrival of BBC1's "Holiday" and ITV's "Wish You Were Here". But those days are long gone, however there are a couple of modern-day replacements worth watching. Firstly, the second series of "TRAVEL MAN" (Channel 4) where the highly intelligent and rather amusing Richard Ayoade teamed up with a different comedy colleague every week for a 48 hour jaunt around various European cities. Now I'm always up for a travel show and whilst I do enjoy this, it can be a little frustrating with that "ironic" style which seems to characterise a lot of modern day television. Although there are many funny moments, it has to be said. Thankfully, the 'irony' was missing from BBC Northern Ireland's excellent "GETAWAYS" which always reminds me of the much-missed holiday show "You Call The Shots" where they acted on viewers' suggestions. 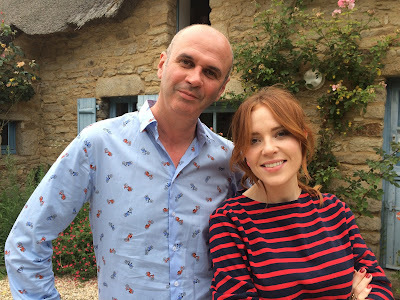 Joe Lindsay and Angela Scanlon are appealing, approachable hosts whose style is inclusive rather than ironic. 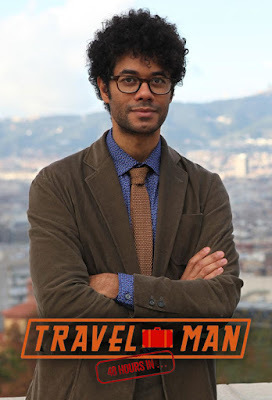 This travel series deserves a prime-time slot on the BBC network rather than being stuck in the Monday night 7.30 pm 'regional programming' slot. As well as the lightweight travel shows I also enjoy a good travel documentary. I'd never seen any of Simon Reeve's documentaries before but tuned into "GREECE WITH SIMON REEVE" (BBC2). This two-part documentary was pretty heartbreaking at times, delving into various aspects of a country which has not had its problems to seek over recent years and is now faced with a massive influx of refugees. At times it was hard to comprehend that we were actually watching daily life in a modern European country rather than a struggling developing country, left to rot, in another part of the world. Simon Reeve also brought a very high level of empathy and humanity into his reporting, My overwhelming feeling at the end of it all was sadness, but I can only share Reeve's hope that the Greek people's survival instinct will see them through the dark times. Most of the stories on BBC4's "MUSIC MOGULS" series have been told time and time again, but they're well worth one more airing. 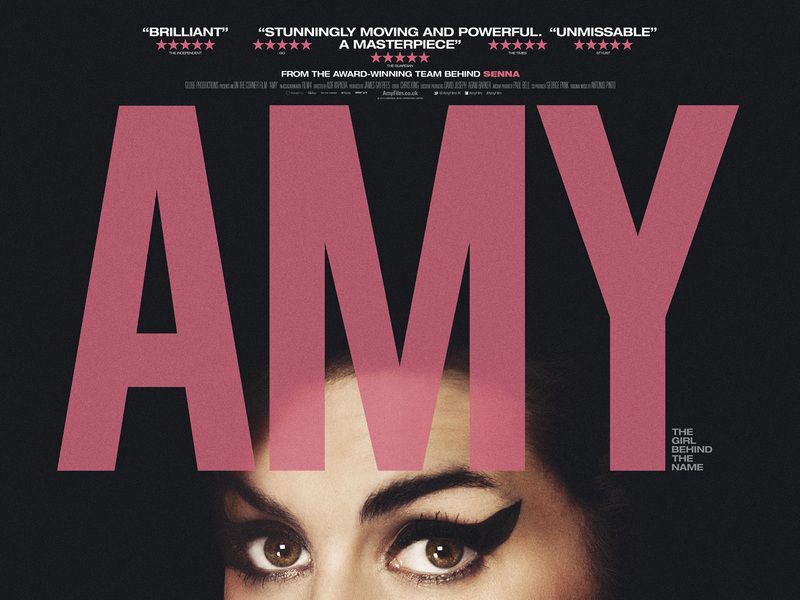 I love this channel's music documentaries and this was no different - this time focusing on music managers, producers and PR. There's been a lot of stuff on telly lately which makes you think, "Why tell us this? We already know!". Last year's "Eat Well For Less" (beyond irritating thanks to the presence of Gregg Wallace) has been followed up with the slightly less-irritating filler of "SHOP WELL FOR LESS" (BBC1). Same format: middle-class home-owning family who spend too much on big brands and designer labels are shown the error of their ways. "We'd like to save money so that we can take the children on holiday" they usually say, Oh, my heart bleeds. Go on, live dangerously, buy some supermarket clothes or something from Primark. You'll live, I can assure you. And you'll get that holiday. This type of show would be more useful if they featured a wider variety of families from different economic backgrounds. Unfortunately British television is only interested in the "working class" if they are "single immigrant mums on benefits and proud". Next up in the what's-the-point filler category was "WHAT TO BUY AND WHY" (BBC2) which compared a number of products, all of which - even the cheapest option - was always too expensive for us. Why bother? Now let's rewind back to June 1994. That was the month when we finally joined the multi-channel world and got satellite TV here at EuropeCrazy HQ. I'd taken a couple of days off work so that mum and I could totally immerse ourselves in this new world. Before I completely go off on a reminiscing tangent (which is probably worth a separate post of its own) you are probably wondering what that has to do with current telly. Well, the day after our satellite dish was installed, the OJ Simpson Bronco chase happened....and so began our obsession with that trial. It may be over 20 years old but for some reason the whole OJ Simpson trial/circus still feels incredibly fresh in my mind. So it's a very surreal experience watching "THE PEOPLE VS OJ SIMPSON: AMERICAN CRIME STORY" (BBC2). 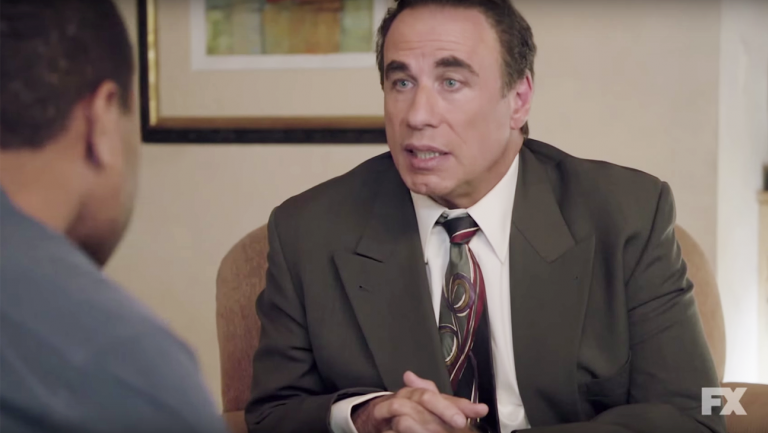 And it has turned out to be almost as addictive as that whole trial circus, although it's worth noting that Cuba Gooding in the lead role looks nothing like OJ Simpson, and as for John Travolta's transformation into Robert Shapiro - creepy prosthetics or what? The major issue I had with the show in its early episodes was the clumsy shoe-horning of Robert Kardashian's ex-wife and children into the storyline: we know who they are, even people on freakin' Mars know who they are, so we don't need reminding. This blog has been going for 9 years now. And as I say every year, where's the time gone? In recent months I was very close to walking away from blogging, purely due to the frustration that I didn't have the time or energy to devote to it any more. But I really want to continue and get to that 10-year anniversary so I'm going to keep things going for another year and see how it goes. Things have been very busy at home since the start of the year as I've been revamping my surroundings, painting, decorating, making big changes - all very time-consuming. As usual I have a huge backlog of unpublished posts but please bear with me, they will be posted on here eventually! So you can expect my thoughts on 2016's Eurovision national finals season, and a trip report from a new (and surprising) destination.